I'm closing down the hatches to focus on finishing chapter one of five chapter of my dissertation. No emails, no skype, no IMs, no online discussions, no feeds (maybe) and no blogging and no going to work. It's taken me almost a week of preparation to get three days of interrupted life for writing, if I'm lucky. Most of the time I wish I wasn't so pig-headed, stubborn and generally OTT (Over The Top). But other times, like now and when I'm doing BTT (cross-country cycling) in the Arrábida - uphill, alone, and totally happy - it helps. I know I said I wasn't going to any more conferences, but I can't believe that the International Communication Association has their annual conference in Dresden with Manuel Castells and Jurgen Habermas - which I could attend for only 100$. My mind has gone into a spin. I want to go! I'm a lapsed member of the ICA whose purpose is "to advance the scholarly study of human communication and to facilitate the implementation of such study so as to be of maximum benefit to humankind" through "encouraging the systematic study of theories, processes and skills of human communication". 1. To me it looks like the labels on everyone else's life are so tidy. You are a "grad student" (in the US sense) or not. Or you a "Professor" or not. Your identity is neatly labelled by your affiliation or your title. Mine isn't. 2. Everyone else seems to find it quite normal to stay in a hotel, go out for meals, take taxis etc. But a few days of doing that in Germany and my month's salary would be gone. I have to look for networking opportunities while sleeping on the floor of FOAFs and eating sandwiches in a café. So, that's decided. I'm not going. My identity is too messy to join the ICA scholarly study of human communication and of finding ways for it to benefit humankind. A moment of self-doubt as I resolve to get back to writing my thesis. As I snowball through my days in hyper-active mode, I stop and take a mindful breath. Recently I read a short book by Thich Nhat Hanh, a Zen Master, about practicing the art of mindful living. It's all in your breathing. The most basic tip for mindful breathing is just to say to yourself. "I breathe in"... "I breathe out" (as you're breathing of course). It's so simple and it works. And I keep forgetting to do it. "Blogs in particular are an important disruptive development on the Internet and to the freedom of speech in general, as they allow everybody to lay down it’s ideas and gather some attention on matters so diverse as our minds can go." "There’s a lot of creative people out there, and not all work for big companies, many of them don’t even work on the fields they love, so blogs will allow them to evolve in other areas, that not they’re own. All of us are creators, some just tend to explore it further." "Blogs connect people everywhere, the idea of a global network is turning to be more and more real each day that passes. I have people from pretty much everywhere reading my blog, that’s something most of us wouldn’t expect. They’re comments and personal messages, give me a window to their realities. And this global share of knowledge and ideas doesn’t seem to have a precedent in history, so it’s results in the future are unclear to me, although I don’t have any doubts that in the end it will be something mostly good rather than bad." "The most important thing to me it’s the emergence of a trully collaborative society, almost everywhere projects are being made that help people connect, share interests, and help each-other ..."
"It’s easier to jump in than to ignore, and those who don’t will for sure lose the race. What’s the price of that remains to be seen." "Laurent has some important ideas about the future of the web, and he’s trying to make an important happening with LIFT, maybe to open our european eyes to this major culture shift that’s approaching us, faster and faster… "
What's my problem? See next post. 1) I am more interested in highlighting cases of success than those of insuccess. 2) I belong to a school of thought (with its roots in Bandura, 1977) which emphasizes that learning is about observing and modeling behaviour we see about us. So to analyse the causes of "insuccess" at my place would have to begin by looking at the behaviour students were modeling. That would lose me my job. 3) I accept that my enthusiasm for the potential learning capabilities of our students is so overwhelming that I will be labelled an inglesa who just doesn't understand Portuguese Culture (the C word again). So unless I can learn to nod and say "Pois, pois ... " and give gloomy stories of my own I will never be accepted in the higher order of people who Worry About Pedagogy. 4) I have no idea what corrective measures means - neither in English or Portuguese. A side issue is that I am also trying to finish writing my thesis. It's mostly about learning ... and it's from the Portuguese context ... but be that as it may. I vote for Vitriolica Webb's Ite in the 2006 bloggies award. 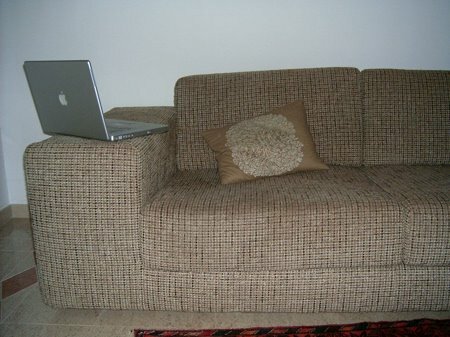 I think Vit's blog is brilliant, but what really did it for me was her reaction to my sofa. When we met for the first time for coffee at my house a few weeks ago, she didn't say - "Excuse me, where can I put my coat? " Nor did she say "Oh, this is a very nice appartment". Or wait politely for an invitation to sit down. No, her first words were: "Hey, what big arms your sofa has! That's just perfect for working on a Power Book!" It was from that moment on that I knew I would be voting for her in the weblog awards. Ao contrario de Mónica em B2b e de ATRIUM não concordo com a opinião de Dumenco que diz: "There is no such thing as a blogger". O seu argumento é: como não existe um "worder" ou "word-perfecter", não pode existir um "blogger". Mas a razão pela qual não existem Worders, nem word perfecters, é porque não há pessoas suficientes que se identificam com as práticas, simbolos, perspectivas ou uma linguágem à volta das actividades "word" ou "word perfect". (Também não existe os verbos "to word" ou "to word perfect"). Eu nunca poderia concordar com uma declaração destas:"It’s just software, people!" Nada é "só software"! Cada ferramenta incorpora uma sistema de valores e práticas. E cada ferramenta está adaptada para fims especificos para uma determinada comunidade. Uma ferramenta é um actividade social e política tanto na sua elaboração como na sua implementação. Acho eu. Já agora ... qual é a sua opinião sobre a expressão "Blog Chick" (como Chica Esperta)? Há uma discussão sobre a utilização da expressão "Blog Chick" que começou com um post escrito por Darwinian Web. Burningbird ficou chateada: "It is woman or women or even, preferred, weblogger – not girl, and not chick." Caterina fica irritatada ser "chicked" em "Chicking Martha". Mas sinto-me mais "empowered" a ter uma idenditade como Chica Esperta Blog Chick do que Docente. I'm loving Darwinian Web's reference to Blog chicks. It's more glamorous than "geeky dormouse", less politically correct than "Blogher" and a hell of a lot more empowering than docente (pronounced duh-sent). To survive in Portugal you have to be doubly smart. On the one hand, and especially if you are estrangeira, you have to follow all the rules, dot all your i's and cross all your t's. Above all you must never lose a piece of paper that proves conclusively your intelligence, commitment or identity. But on its own that's not enough. You also need to build up a repertoire of ways of getting round all those same rules that you must be seen to be keeping. And you have to build a network of people in influential positions who will help you to get round them. At the same time I am also Beverly the Blog Chick who dabbles in being international, entrepreneurial and pedagogic and who knows how to get round all the rules just like any other Chica Esperta. It's the Chica Esperta who does and who makes things happen. So far I've not been very adept either at keeping the rules, nor at getting round them. But organising my identity between Duh-sent and Chica Esperta Blog Chick is proving to be an empowering experience. Based on my referrer logs I've discovered a valuable lesson. If you link to female bloggers and say nice things about them, they link right back. Weird. Guys don't do that. When is the next Blogher? I'm on a mission to wean myself off the computer. I want to learn more about relating to people same-time same-place, in Setúbal, with no pre- or post-online phase! So last night I agreed on the phone to go for a drink with a casual acquaintance, similar age to me but showing no signs of any addiction or personality disorder related to new technologies. Half an hour into the conversation he asked if I wanted to go to his house. Puzzled I asked him why and he replied that he had a "barrote". Reminding myself that he wouldn't be referring to a new Mac widgit or an Ajax application I imagined that a barrote could be some kind of vintage car or whisky. No, I can't go tonight I said, but another day would be great. Thanks! The drinks finished and I returned home feeling like I'd successfully accomplished my first mission. A normal conversation over a beer in a bar. This morning I discover that he was telling me had a hard-on, a stiff whatsit, an erection. Hmmm, without a spam filter or a delete key I can see that I'm going to have to learn a whole new set of vocabulary and way of talking to people. I went to check out the site of Alentejocoast.com after Marjolein Feith, the "initiator and storyteller" wrote to ask if they could include my link on their site. It's an online magazine from the Alentejo coast in English. It's full of rich articles about art, food and wine, music, and buying a house. For sure I'm very happy to have my blog included there. The magazine is just terrific. I'm only frustrated that, like most online magazines and newspapers in Portugal, they don't have an RSS feed. If a page doesn't have an RSS feed, then it drops off my map. Nothing to do with the quality of the page, but just because if it doesn't come to me, then I deal first with the other million things in my life that do. And talking of RSS feeds, how come Google News from all the English speaking countries have a feed, but the non-English language countries, including Google News Portugal don't? Yesterday my (adopted) son had to go to a notary to swear that he is not Portuguese. In this labyrinth of Portuguese bureacracy I also had to swear that to the best of my knowledge he is not Portuguese. In fact he was born and brought up in Portugal and his first language is Portuguese. He is also bilingual and has some perspectives that mark him out from his peers - but as far as he is concerned he is as Portuguese as the next guy. His mother (who lived in Portugal for 26 years) had a British passport and his father (who he hardly knows) is Croatian who lived in the United States and got a US passport. So my son has ended up with a British passport and a US passport. He has been to UK three times (a week-long visit each time) and finds the people and the place alienating. He has never been to the States but dreams of going. In a welcome but strange twist I receive, courtesy of the US social services, a monthly contribution to his welfare from America. As we left the notary, the lawyer said to him: "You know you are entitled to a Portuguese passport, if you want to consider applying for one." He looked at her in surprise. "I don't need a Portuguese passport" he said. "I am Portuguese". I chuckle every time I see the Caixa ad. on T.V. - Caixa being my bank and the large State bank in Portugal. A young man gives his destination to the taxi-driver who is just getting into the taxi. On hearing the destination the driver stops dead in his tracks, peels off his sunglasses and looks at the young man. "Caixa?" he says. "You want to go to Caixa?" "You can get to Caixa via SMS. You can get to Caixa on the Internet. The ad has a certain poignance. In my Caixa the ink and tissue sit on the "balcão" for clients who can't sign their name. I have stood at the counter with fellow-clients for whom the bank experience and the bank manager is a social affair. It has to be because they can't read the letters or the statements. Their business becomes our joint face-to-face concern. How I find myself at the intersection of so many parallel universes! It's what I love and find so frustrating in my life in Portugal. Identity is what I don't have where I work. Or rather, the gap between my identity where I work and the one I have of myself has become so big that I have no idea how to bridge it. Today I had a brainwave. If I stop being "exclusiva" and take up more of the work that's offered to me outside my Institution, then my current employment would just be a little extra something that I do to keep up a small regular income. My main income would come from the different projects and workshops I'm being invited to advise to or run. That would leave me free to define and give myself a name that's more in line with who I think I am. Feeling who I am in life will help me write my doctorate and will help me get clearer about my categories. Blogger doesn't have categories so I have to move to Wordpress. The third national blog meeting in Portugal (3º encontro nacional sobre weblogs) is set for the 13th and 14 the October, 2006 at the University of Porto. What would it take to see a better show of women at this one? An equal balance of men and women bloggers????? In his series of interviewing bloggers, Hugo of Lisbon Lab interviewed Rui Carmo (in English) about his bliki , Tao of Mac. What I like about Tao of Mac is Rui Carmo's understated style, pragmatic attitude towards Macs and that he writes from a Portuguese context. Oh yeah, and he's a leading geek, whose blog sub-title is "Tech Made Simple". I'm slightly regretting that I didn't invite someone like Rui or Hugo to the Web 2.0 conference in CPsquare to play around with some ideas about weaving together technologies and communities of practice in Portugal. Hmmm ... I wonder what it would take to start a new meme - Portugal 2.0! "While the linear, the hard and the metallic have certain appeal, I've always preferred the voluptuous, the soft, the fleshy. But mostly I'm interested in the ontological and epistemological dimensions of things that squish and leak, things that move, things that always already shape-shift." I have to make sure that I know the Portuguese words for those synonyms for 'flexible': "adjustable, alterable, compliant, elastic, formable, impressionable, indulgent, irrepressible, malleable, recuperative, susceptible, unstable, yielding." And I'm wondering about people's reactions as I speak of my methodology as 'soft' in Portuguese: "affectionate (carinhoso), caressing (carícia), comfortable (confortável), easeful, effortless, faint, fleshy (corpulento, sucelento), fluid (fluido), gracious, melodious, murmured, pitying, soothing, spineless (fraco), undemanding (inexigente) weak." I'm all there - many won't be! Terence had a notably firm grasp on the range of human variety: "So many men, so many opinions" was a line of his. And it's in his comedy "The Self-Tormentor" that you'll find what may be the golden rule of cosmopolitanism - Homo sum: humani nil a me alienum puto; "I am human: nothing human is alien to me." The context is illuminating. A busybody farmer named Chremes is told by his neighbor to mind his own affairs; the homo sum credo is Chremes's breezy rejoinder. It isn't meant to be an ordinance from on high; it's just the case for gossip. Then again, gossip - the fascination people have for the small doings of other people - has been a powerful force for conversation among cultures. I have lots of people to thank for 2005, but in terms of blogging I'm really very happy to know Nancy White of Full Circle from whom I get more than my fair share of inspiration, ideas, links and encouragement. People whose interest and comments have spurred me on have also come from Sãõ em Timor and Zé Rebelo who might one day start his own blog. Mónica André from B2B is a FOAF but, in our online interactions, has come to feel like someone I have met and know well. I went to desabafar (or, rather - to rant) on Ricardo's blog of zone41 which began Estes ingleses continuam os mesmos ... (These English people carry on in the same way...) and value our brief email communications since then. A project that I celebrate is the Blogopedia - uma enciclopédia de weblogs e bloggers, servindo de fonte de informação sobre projectos editoriais e seus autores, started and mostly maintained by Paulo Querido. I have to hang around the edges because I'm not one of the bloggers que editam em língua portuguesa - I mostly write in English, but read, comment and sometimes write in Portuguese. Paulo Querido has started keeping his blog in Portuguese and in English. I am inspired by the way it is laid out in English, Portuguese and both languages. That's how I would like to do mine one day. I'm going to suggest a session on bilingual blogging for the next blogging conference. I commented on Sabine's courage to talk about an intimate health problem she had in Insustentavel Leveza and feel touched by our brief exchange of emails. I have been blown away by the breadth and depth of the BlogHer conference that I attended in July 2005. At the time I didn't fully appreciate the enormity of the event and its potential influence. I now feel even more grateful for the invitation and sponsorship of my participation which happened through Nancy White. A conversation has started in the Blogopedia about holding a BlogHer em Portugal - or a similar women's blogging event. Without overcommitting myself as I have a thesis to write, I hope that gets going. Thank to Harry of Para inglês ver - his comments, our backchannel conversations and his supporting words have spurred me on in times of low motivation. And to Paulo of Pauloya - a Portuguese guy living in Turkey - for his comments and sharing of experiences about living em duas línguas. I have had a lot of fun reading Vitriolica Webb's ite at Unkemptwomen. Her disrespectful drawings and descriptions of Portuguese, English people and tourists in Portugal are familiar scenes and sometimes have me howling with glee! I probably pass by her house when I go cycling and we're talking about meeting up for coffee. She started a collaborative blog story and I am fascinated by the way in this online world that Nancy White from Seattle, USA - who I know - is writing a chapter for the blog story organised by Vitriolica in Azeitão, PT (next door to me in Setúbal) - who I don't know. And talking of Seattle and online connections, I love the way that Lee LeFever of Common Craft, a blog about social design for the web that I used to read, has taken off with wife to travel round the world (see "The world is not flat") and that Setúbal, Portugal is on his agenda when I'll meet him. As I said in my (imaginary) nomination of João Vasconcelos Costa's blog Reformar a Educação Superior a big thanks for the really informative content of his blog and the way in which he does it. After a couple of emails related to my comment about him not tagging, he has now started tagging - and I feel satisfied to imagine I influenced blogging in Higher Education in Portugal. Particularly special last week was receiving the poems of Masud Taj of Black Cube whose articles I pondered on in September and December of 2004. I think they are inscapes, a form of poetry that has me spellbound. Imagine a poem by a cockroach that keeps you mesmerised - black cube magic? There's lots more, but in short I feel quite overwhelmed by the doors and windows that have opened up with blogging. And while some people might think I spend my life just sitting at my computer, I hold quiet in the knowledge that I'm part of an active world of events and social relations taking place in a time/place dimension that may be passing them by!